A Feral Cat is simply a cat without a home. Just like a homeless person, they go unnoticed by most everyone just the same. If you could for a minute consider what life must be like for them I think your perception would change if you’ve never considered this before. There are 2 kinds of street cats and neither is a good situation. Some have had homes once and were let out on the streets to fend for themselves because their kitten cuteness was gone and or they came into heat and their people weren’t educated enough to realize what that is. All too many times someone has asked me why their cat is now hyper or marking and spraying. Recently after my insistence that a store owner spay his female he asked me why she was so mellow now. He thought she was sick. I knew that it was only a matter of time before she left the store and would most likely get hit by a car since the store is right on the main streets. If she made it safely, she would get pregnant and not return to the store and begin a life of pure torture; And multiply into the hundreds if not thousands. All because of one NON-spay and the simple ignorance. Most of these feral cats however were born on the streets. Their mothers are baby making machines since this is their instinct and they are not spayed. A cats view on the street is about 12” from the ground. They search for any type of safe shelter. This can be anything from under a car tire to two crossed pieces of boards in an alley. Whatever they find is of little peace because cats, like most animals, are prey animals and only the strong survive. They not only need to be wary of other cats that are not in their colony but also of dogs, humans & cars to name a few. The worst of all predators are the humans that are indifferent to them and feel they are no better then a pest. I have had people tell me that they ground glass in meat and give it to them. Another told me that in his country they cut them in ½ with a shovel. The indifference is unimaginable. They live in the hot weather without benefit of access to water. If they find water, it’s usually green or contaminated and they will drink it. In the cold months there is no water at all because its frozen. Cats are all about muscle and they need much water and rest. An average house cat typically sleeps about 18 hours per day. But a feral doesn’t have that luxury for they are constantly in fear of their safety or the safety of their kittens. When its freezing cold their fur is NOT enough to keep them warm. These feral cats are freezing just like you and me. And there is less food to be found in the cold as well. Both of these weather conditions count for a great many deaths of the feral cat. Their normal body temperature is no more then 102 degrees. Ours is 98. That’s only a 4 degree difference. And their life span, if not in a fed colony is around 4 years. 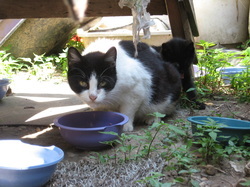 As for the house cat that has been thrown out like yesterday’s trash, you can’t imagine how terrifying it is to have known a warm safe home and then be a feral cat out in the street where there is no shelter and safety; Without having had the benefit of a mother to guide you on safety and food scavenging or a colony to protect you. And not only that, the street cats are not welcoming to new comers. A feral cat may get to sleep somewhere in the dawn hours of the day. They are never at rest and they don’t like living this way. They want to trust you but experience has proven that most humans can’t be trusted. Some of them go out of their way to harm them and some use them as bait for their dogs for various reasons. This is life in the city and there is no reprieve except for the few that do come out and feed them. Food is not enough. It doesn’t wipe away the fear and it doesn’t stop them from multiplying. It doesn’t offer a warm touch, a warm house and peace of mind. It doesn’t put the Mama cats mind at ease when she can’t find a safe place to have her babies. It is in fact, a very small although helpful gesture to feed them. But it is also contributing to the cycle. These cats frighten most people, I’m sure. They seem to be wild and unwilling to be friendly. I can assure you that 90% of them will adopt themselves to your home and loving care in time. I know as I’ve take in many a feral. And I’m more then willing to help you through your situation if you have one such cat in mind. If you happen upon feral kittens that are under about 2 months old this is already too old for them to trust you. Their mother has already taught them to stay away and be afraid of you. You will either have to just grab them up or make a daily effort to show them that you’re not the enemy. Sit near a cat you wish to adopt on a daily basis. Don’t approach it, just sit there. Talk nicely and maybe read a book if the area allows. In time you’ll be able to set down a trap or carrier with some food in it and they will go in. Why the courtship? Because after you’ve caught the cat(s) it will be in the back of their mind that you have done them no harm in the past and most likely will do no harm now. That doesn’t mean they won’t be afraid or hiss at you but it will be in the back of their mind, so to speak, making further communication and handling easier as time passes. First instinct for most dogs is love. For a cat its TRUST, then love. I usually release them into a bedroom which is clear of any junk and the only place they have to hide is under the bed. They will go straight there. Put a litter box near there and also a bowl of food. Speak nicely to them and leave them be. Go check every once in a while and reassure them. If you have other cats this actually helps because they see how the other cats interact with you and they see you aren’t killing them or harming them. If not, they will come around. You may want to close the door and give them some space to walk around and get acquainted with the room. After they seem okay with that, go ahead and open the door. Baby steps. Trust me, after you’ve gotten your cat feeling safe and in trust of you, you will be amazed at the relationship you can have; can develop. Keeping a feral cat in a cage expecting it to calm down is NOT going to happen. Put yourself in that situation hypothetically? Please give them space. Often there are older ferals that are just dying to have a warm home. They’re beat. And in fact sometimes they look beat and scarred up from frequent fighting. They can be as young as 3 years old but in their life time they’re old and worn out. Life has beaten them down and their personality wasn’t one to be fighting on the streets to begin with. Or they may not have the body weight to hold their own, whatever the case. They only do this to survive but its not their nature. These are the ones that will give you the least resistance and open up their hearts to you faster then any other. I have literally gone outside and picked two such cats up and carried them into my home. There was one nasty Mama cat that had no street smarts at all. I wanted to save her from herself and from being hit by a car. She was a hisser and a biter. But I knew it wasn’t in her heart and that she was just in fear. One cold day I noticed that she had given birth and suspected that this litter, like her other litters, had died. She was sick and most likely had mastitis. She was infected and her eyes were watery. This cat, that I could not have caught in a million years at any other time, was finally in a position to where I might have some luck. I opened my door and placed a cat carrier there with food in the back of it. I used Tuna. She was so desperate that she did the unthinkable and walked right in. It took about 3 months before she allowed me to pet her. Unfortunately she died 2 years later of breast cancer. But she died in a warm home and had known love. Un-spayed females run a great risk of breast cancer. Back to the kittens: Once mama has raised her kittens to about 2 to 3 months old her call of the wild kicks in again and she soon abandons her kittens and begins mating season again. She is usually giving birth several times before her kittens have reached the age of 1. IF they manage to reach the age of 1. Because now they are left to figure out the way of the street and are faced with other colonies of cats to fight. Colonies are usually families of cats. They are usually related but not necessarily so. Sick cats are the easiest to catch because they’re desperate and well, sick. Last summer I went to feed my feral’s and we have a cat house for them. It doesn’t matter whether or not you’ve been feeding them for years on end, if they hear you coming, they leave the house and return to it after they see you walking away. It’s all about not being trapped for them. So when I went to put the food in the house I was greeted by screams. It was so loud I jumped back. I bent over and saw a cat I’d never seen before. He had blood coming out of his eyes, nose and mouth. He was so emaciated and dehydrated I didn’t think he’d live through the night. He was in such dire straights that he allowed me to clean his eyes, put drops in them, wipe his nose and all other such things my own cats would never allow. He thinks I’m God. He knew he was dying. To be honest, I can’t believe he’s alive. But he is and he’s a pleasure. He is now one of my biggest snugglers. Don’t feel that because a cat is sick it's dying. Put yourself in their place and think about how long it would be if you were in those conditions before you looked horrible? A little TLC goes a long way. RECAP and SPECIAL NOTES: Many people seem to have the odd notion that if you take a stray or feral cat and keep them in a cage that they will eventually come around. This logic is seriously flawed and bares no sense. Anyone kept in confinement is not likely to warm up to its captor. Think about this. BE the cat and ask yourself how you would react. In rare cases it may be fine to keep them in a large cage near you and the other cats so they can see you're intentions are good. But I would not let this go on for very long. Cats are often judged by their likeability and ease of showing affection. It is presumed that if a cat is huddled in a corner of a cage at the shelter that it is not friendly or has never had a home. Again, put yourself in their place. It’s loud in a shelter and its frightening in confinement. Trust first, love later.. So Keep in mind that even if the cat has been in home prior to their landing in a shelter, the majority of people that get cats typically only get one or two at a time. They work and often don’t have many visitors. So the cats are still scared of all the noise and people surrounding it in the new environent. Cats are considered easy care and are often left alone. They will build very strong bonds and trust with their person or people. And once removed from that situation will be frightened and not so apt to run to the front of the cage for you to pet. But they do and will come out of their shell not long after you bring them home. By saving one feral cat’s life you will be saving thousands. Every other week a female cat is in heat. There are ample male cats around to ensure that an un-spayed cat can breed itself to death in no time. And while so doing, produce more females. From start to finish it is roughly 2 months to giving birth and then the cycle continues. WHAT CAN I DO? I want to help but I can’t volunteer and I can’t donate, what can I do? Answer: See a cat or kittens you want to help? Keep an eye on them and try to take their picture. Upload and send to all local rescue groups and ask if they can include the photo’s on their site. If you can foster, that’s great! The rescue group might come and trap them for you or give you a trap should they find a home for them. Or you become a certified trapper. Check your local area for programs. BEFORE you go with just any old rescue group please ask them questions. Don't assume they think or feel the same as you do. Many of these groups will automatically put down any cat or kitten that tests positive for FIV or FLV. Find out where they keep their cats and how or if they adopt them out. Most helpful links for cat rescue, trap/neuter/release and other information. These are mainly NYC sites but the links and information are for everyone. NYC has a huge battle but also has the most amazing groups of people and organizations attempting to make a dent on a daily basis through rain or shine. The Mayor’s Alliance program is one that should be adopted by every state. I have not listed ALL the wonderful groups here but these sites will lead you to many other sites. http://www.savekitty.org PLEASE volunteer and help. Also, read links and view video at bottom of page. I have met people from Connecticut and New Jersey in their waiting room. Excellent care and extremely affordable spay/neuter at $45.00. LOVE THEM! ASPCA NEW YORK. On the day my 3 rescues were spayed and neutered by them they also spay/neutered 150 other cats for FREE. God bless! I would say that no less then 500 to 700 cats are spay / neutered for trap and return by countless numbers of individuals and rescue people monthly in this city. VOLUNTEERS: are needed for many a small rescue group or individual person that feeds colonies. Colonies remain in one area and this is referred to as their feeding station. People from all over the world incorporate these trips to feed them in their daily routine. If you notice a colony, please try to find out how you can help. If you see they are being fed, leave a note nearby for the person to know you are willing to help. Most of these people are out of pocket on this and go without bare necessities to do it.